Browned edges mean great flavor for this side. If the squash hasn’t browned, roast it a little longer. Tahini is available at Middle Eastern markets, natural foods stores, and some supermarkets. Arrange racks in upper and lower thirds of oven; preheat to 425°. 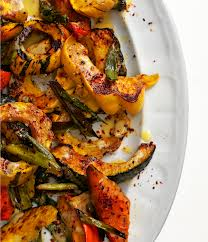 Place kabocha on a rimmed baking sheet and delicata on a second sheet. Divide 3 tablespoons oil and 1 1/4 teaspoons cumin between sheets. Season squash with salt and pepper; toss. Roast for 15 minutes. Combine remaining 1/4 teaspoon cumin, 1 tablespoon oil, and scallions in a small bowl; season with salt and pepper and toss to evenly coat. Scatter scallion mixture over squash, dividing evenly between sheets, and continue to roast until squash is tender but not mushy, about 15 minutes longer (time may vary depending on squash). Meanwhile, whisk lemon juice, tahini, and 1 tablespoon water in a small bowl to blend. Gradually whisk in remaining 3 tablespoons oil. Season to taste with salt and pepper. Transfer squash to a platter. Drizzle tahini sauce over and sprinkle with Aleppo pepper.